The Principles of Disruptive Innovation, ie the radical innovation necessary to succeed on the market today, are often interpreted in the wrong way: this error is the basis of the current crisis of the Great Players of the Market. 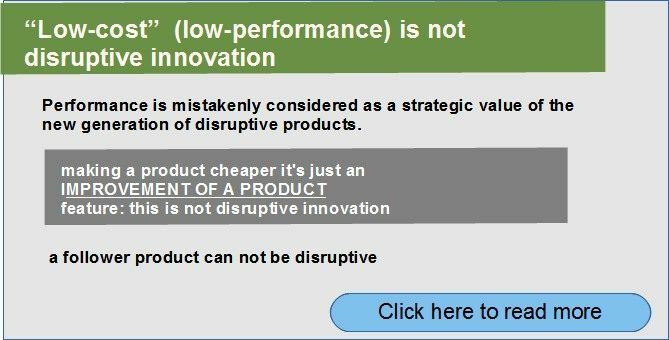 One of the misunderstandings on disruptive innovation is what leads to define a disruptive innovation product as a “cheaper” product than those offered by the incumbent Players. of the new generation of disruptive products. But “performance” (“technological” performances) is actually an objective of the strategies of the previous non-disruptive market phase. In the new Era what matters is the actual value of the product (the value actually useful for the User). In fact, disruptive innovation does not bring much attention to technology, but the question is simply to adopt “low-cost” technologies already used, as these technologies have for years been able to produce the features that today are needed to develop a radical innovation. to creating effective useful Value for the User. ➽ technologies do not have a strategic role: technology is no longer an end, it is an enabler. Or when a consumer tecnology (low-cost but hi-level functionality) is available on the market, a disruptive innovator is able to develop a new type of product that satisfies the needs of people that have not aready been satisfied (or have been satisfied by services provided by professionals). In current strategies -“selling” products on an emotional level – the Marketing of big Players relies on the sophistication of the technologies used in the product (selling in this way new products that have a level of utility-effective practically corresponding to that of the old product) . ➽ the low-cost economy size is not a primary factor for the success of the product. But the strategic advantage is provided by the new features “invented” by the disruptive innovator that constitute new forms of Value-useful for the User. This type of misunderstanding exists because the current Culture of the Market lacks an awareness of the “Value” of the product, and therefore tends to take into consideration the “performance”. The problem is in the incorrect choice of the term (as Clayton admits – see below): the use of the term disruption brings the focus on the negative consequences of this type of innovation. That is to say with this term it seems to indicate that a product that puts in difficulty a market sector is disruptive. It is therefore crucial to understand that the term disruptive does not indicate an improvement in previous products. But it indicates the transition to something really new: a quantum leap that brings on the market “new things” that can effectively change the lives of the users (and only as a side effect, in this case you have a disruption of the incumbents) . ● the low price is only a side consequence of disruptive innovation. ● that the actual “performances” (those actually useful for the User) of the disruptive product are much higher than those of the other latest generation hi-tech products. The misunderstanding is obvious: if the low price of the product was a sufficient feature to define it disruptive, then products like the Tata Nano car – which costs a few thousand Euro – would be considered a case of disruptive innovation. Undoubtedly the Tata Nano is very innovative for the production mode. But it is not at all innovative for the product itself, in the sense that it does not bring about any improvement in some aspects of the car (instead it leads to an impoverishment of the performances). A significant example of an actually disruptive product produced in India (under license) is that of the Ape car, the 3-wheeled vehicle of the Piaggio (basically a scooter with a loading floor) of 1948 (which was also produced in India). This is the case of an alternative to a normal vehicle which entails, among other things, lower tax and operating costs than those of a “normal” vehicle with similar performance. It is interesting to note that the Tata Nano, being highly competitive in price, according to the “experts” should have created big problems for the incumbents. But it has failed (it is no longer produced). ● disruptive innovation that is emerging in an increasingly important way. ● the resistances (not really legitimate) by the “establishment” (as it is in the case of other highly innovative products: Uber, Arbnb, etc …. In the case of the Tata Nana we can think that a really disruptive product would have had more luck: as in the case that it was a new generation of electric city car, because in this case, for example, the big players and government institutions could not have placed great obstacles to its sale due to the fact that it would have represented an irrefutable quantum leap regarding the ecology. See the new generation of vehicles such as the Elf (structured to be equivalent to motorcycles in the tax system). With a radically innovative City Car, Tata would have moved the competition in the City Car sector, in the context of which the Automotive Players are not able to. See the article ““Automotive: beyond the automotive” <see> which foresees a fork in the Automotive sector with which current Players will continue to develop cars for extra-urban routes, and new Players will develop cars used for the urban mobility. And Christensen, who coined the term, is clear: making an existing product better is not Disruptive innnovation (a truly disruptive product produces a quantum leap compared to previous competitor products). Using the classic language of the market, who produces cheaper products than the competition is called Follower.